Moments after the jury’s sentence was announced, as it became clear that Dzhokhar Tsarnaev was bound for federal death row in Terre Haute, Ind., I turned to my left. In the second row on the far side of Courtroom 9, Bill and Denise Richard leaned forward, dry-eyed. Two rows in back of them, Liz Norden wiped tears from her eyes. The Richards opposed the death penalty for the man who murdered their 8-year-old son, saying it would lead to an endless cycle of appeals, keeping Tsarnaev in our collective consciousness forever. Liz Norden, whose sons JP and Paul lost their legs on Boylston Street, believed Tsarnaev deserved to die for what he did. Their reactions might not have been expected by most, but trying to predict reactions in the abstract is meaningless. So, too, was the widespread belief that a jury in Massachusetts would never sentence anyone to death, even someone as cruel and remorseless as Dzhokhar Tsarnaev. Because the jury wasn’t dealing with this in the abstract. It was right in front of them, day after day, for more than two months, words and photos and videos that sickened them and brought them to tears. Maybe it was the video the prosecutors played, the one from someone’s cellphone, just moments after the first bomb exploded outside Marathon Sports on Boylston Street. Tsarnaev was sentenced to death Friday for his role in detonating two bombs near the finish line of the 2013 Boston Marathon. It was cinema vérité, shocking stuff. It captured the chaos, the slowly widening red pool of blood on the sidewalk. It captured Krystle Campbell’s death wail. Her agony passed through everyone who heard it, like a chill. Maybe it was the photo that showed Dzhokhar Tsarnaev lurking behind a tree outside the Forum restaurant, the backpack carrying his bomb placed on the sidewalk, four feet from the back of Martin Richard. Tsarnaev lingered there for four minutes before walking away and detonating his bomb. Maybe it was the autopsy photos of Martin and Krystle and Lingzi Lu and Sean Collier, photos that only the jurors saw, showing what the shrapnel and bullets that Tsarnaev and his brother sprayed so wantonly did to human bodies. 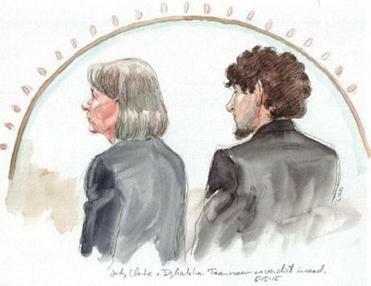 Whatever it was, the jury that sentenced Dzhokhar Tsarnaev to death saw something, heard something, felt something not seen, heard, or felt by the 85 percent of Bostonians who, like the Richards, said they preferred that Tsarnaev be sentenced to life in prison without the possibility of parole. I don’t support the death penalty, never did, but I sat through every day of this trial, and I am not surprised that the jurors decided as they did, especially given that they had to swear just to get on the jury that they did not oppose capital punishment on moral grounds. Like me, those jurors studied Tsarnaev every day, searching for something that might indicate that what he did to people, by killing them, by maiming them, bothered him. He never revealed anything, and his inscrutability, his seeming lack of empathy, didn’t help. Neither, in the case of at least 10 of the 12 jurors, did the testimony of Sister Helen Prejean, she of “Dead Man Walking” fame, who insisted that during her jailhouse visits, Tsarnaev was remorseful, that he regretted causing so much pain to so many innocent people. In the end, jurors trusted their eyes more than they did Sister Helen. And maybe none of that matters. Maybe even if Dzhokhar Tsarnaev broke down in tears as Bill Richard described his Hobson’s choice of leaving a dying son to save a dismembered daughter, it wouldn’t have changed a thing. Maybe even if Dzhokhar Tsarnaev’s bottom lip quivered as Jess Kensky described losing her second leg nearly two years after losing the first, jurors would have concluded it was too little, too late. Clearly, Tsarnaev and his angry, homicidal older brother had looked right past the humanity of those people who stood, smiling, enjoying the Marathon, right up to the moment their bombs exploded. But maybe even if the jurors had seen some humanity in Dzhokhar Tsarnaev instead of a blank, bored stare, they would have decided on death. Maybe the evidence — appalling, shocking, horrific — brutalized them, haunted them, gnawed at them, leading them to inevitably conclude that the most appropriate punishment for someone who engages in such premeditated, callous murder is to kill them. It is not how most people who live around here thought this would end. It is not how many of those most aggrieved by Tsarnaev’s depravity — the Richards, Jess Kensky and Pat Downes — wanted it to end. Still, it is what it is, even if it provides a discordant coda to a two-year period in which this brutalized city responded with the sort of selfless grace that saw cops and firefighters and paramedics and ordinary citizens running toward the bombs to help strangers. As horrible as the Boston Marathon bombings were, as terrible as the human toll was on victims and their families, the communal response was life-affirming. Now, the final response, in the person of the jury, is to affirm death as the most appropriate punishment for Dzhokhar Tsarnaev, something only a small minority of the wider community wanted. This will, no doubt, satisfy in some — if not many — a primal urge to punish commensurately, some deeply held notion of justice, some sense that the ultimate crime deserves the ultimate punishment. Still, it is a jarring, dissonant note to end on, more philosophically in tune with the “eye for an eye” perspective than the “save lives at all costs” ethos that sent first responders rushing headlong toward the injured and the unknown. But second-guessing the jury, suggesting they are not reflective of the community they represented by proxy, is beside the point. They sat through and heard and saw the evidence, including soul-crushing photos deemed too ghastly for the rest of us to see. To those of us who live in and around Boston, the Marathon bombings were never about death as much as about life. We were in awe of and paid homage to the lifesavers, including those Watertown cops who tried to save Tamerlan Tsarnaev even after he tried so desperately to kill them. The real legacy of the Boston Marathon bombings is not going to be about the way the Tsarnaev brothers cynically killed, but the way so many good people saved lives and limbs, the way an entire city and region came together, the way we all healed psychicly as the victims healed physically. Karen Brassard, who along with her husband, Ron, and daughter Krystara was badly hurt in the bombings, was right when she said this process would not bring closure to the victims. The trial and punishment of Dzhokhar Tsarnaev wasn’t about closing a book, it was about turning a page, and as long as he lives on death row, filing appeal after appeal, Tsarnaev will remain on future pages. Some will say the jury went against the wishes of Bill and Denise Richard. But the jury went against Martin Richard’s wishes, too. That innocent, idealistic plea he wrote in with a marker on a piece of paper in school. Having heard all the evidence, having looked into Dzhokhar Tsarnaev’s soul and their own, the jurors decided one more person had to die.